On a somewhat frequent basis I get a call from a user desperate to rid their drawing of the plethora of duplicate objects that in one way or another has plagued their drawing. There is of course the grueling method of individually selecting each duplicated object and running the ERASE command, but surely there is a better way. A better way does of course exist within the beloved “Express Tools”. 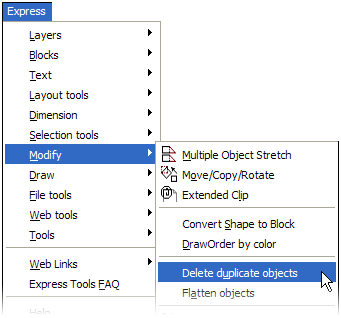 Among the modify commands contained within Express Tools is “Delete duplicate objects”. Personally I find that terminology to be boring, and thus I normally type the command “OVERKILL”. Yes, a likely top ten contender for most comical command names is the OVERKILL command. After invoking the command, select the objects you want to clean up. It does not matter if the objects are on different layers; the command is smart enough to sort that out. After selecting all of your duplicate objects the OVERKILL dialogue box will appear where we must instruct AutoCAD how to clean things up. The Help file provides a pretty comprehensive explanation on what each of the options do. Personally when I run this command I like to keep all of the “Ignoreâ€¦” checkboxes unchecked, and all of the “Lines, Arcs and Plines” options checked (as illustrated). 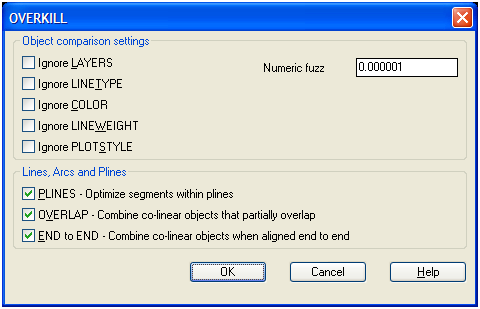 Traditionally the default “Numeric fuzz” works for me, but if I have a really bad drawing I will up its value. You have likely used the saying “Close enough for government work”, well the numeric fuzz is like that. Upping its value will allow the OVERKILL command to combine objects that are further apart. The time the command takes to complete will of course vary based on both your computer and the number of objects you selected. Likewise the OVERKILL command can be somewhat entertaining to watch, as it is known to make AutoCAD look like it had one too many cups of coffee â€“ this is normal. When finished, any duplicate objects selected upon starting the command should be history. I have problems using overkill – I also miss the express tool menu. Do you know what the problem is? Reinstall AutoCAD and make sure you checked the express tools package while doing so. I can’t use OVERKILL in AutoCAD 2008. What kinds of command change in AutoCAD 2008? Please inform me in my email about that. Thanks a lot.